The sky has never been no limit for mankind. We have strived to conquer it since before Babel. We have stretched, and we have struggled, and we have yearned, and we have built and built and built – we always have, and we always will – and thus we have, time and again, sowed the sweet seed of our own destruction. This art association is about the fruits of this seed: Towers. It’s about the unconditional, selfish, savage hope that makes us build them, forcing a better future, not for our kids but, rather, for ourselves. Societies grow stale when men build towers whose shades they know their sons will shiver in. 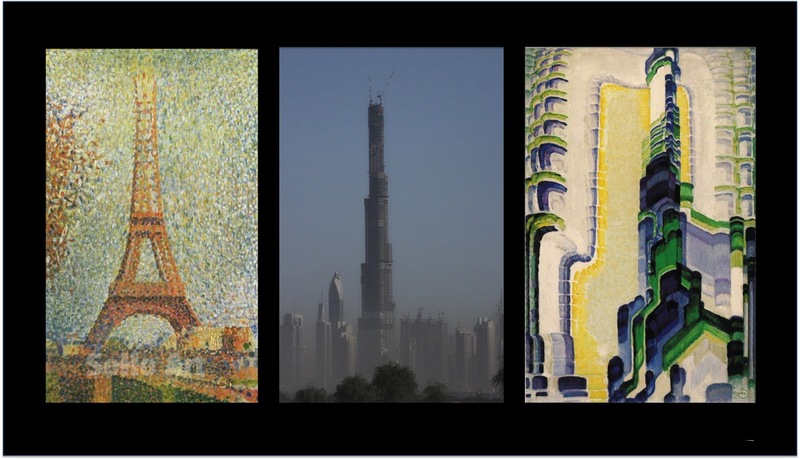 We look at these towers – Seurat’s Eiffel tower, Sheikh Kalifa’s Burj and Kupka’s Vert et Bleu – and we can see how they are growing into the heavens, growing out of all proportion, growing because men have lost all sense of what’s within their grasp, and what is beyond their reach. We look at these pieces and we feel a touch of that childish, innocent, self-sacrificing leap of faith, the leap of faith it takes to build something so absurdly big, colorful and steely. We feel the hope, the rush, the wind in our hair, the vertigo, the endless possibilities. We hold in our little hands a tiny bit of the whole, big omnipotence of the tower-builder. We look and feel the shadow of the nagging doubts that must have haunted everyone who has built or climbed a tower, the premonition that what goes up will come down, the feeling that it’s just not quite right, not natural, almost immoral, that since Babel towers have drawn the dire ire of jealous man-child-gods and demons. We look and feel the the hatred of little men in the face of great things. We feel the power, too, of the man who owns that phallus, and we feel jealous. We feel the sheer absurdity of the shapes and forms and endlessness of it all. We feel, maybe above all, the helplessness of man in the face of such gargantuan giants. The ultramodern visions of the Bauhaus (right) were so modern that they contributed to a crisis of modernity, and set back the advent of the tomorrow they yearned for until later in the century. Burj Khalifa, built on desert sands, almost never got built at all. Ironically, the Eiffel tower was never meant to last, but has. Maybe that’s the way to build a tower to withstand the whirlwinds of the world and the rages of fate: by turning one’s back to it and getting on with earthly business. It’s almost as if the sky had a sign on it: Wet Paint. Don’t Touch. Who could resist? We seem to think that where there’s hubris, there’s hope. Maybe we’re right. The day after the day when we give up on a better future will be a sad tomorrow. Or paradise. PS: We wanted to include Gotham City and Saruman’s Isengard, but then we thought we’d rather keep it real, seeing as there’s enough madness in reality.